The ocean is full with strange and beautiful creatures. Pineapple fish is one of them. 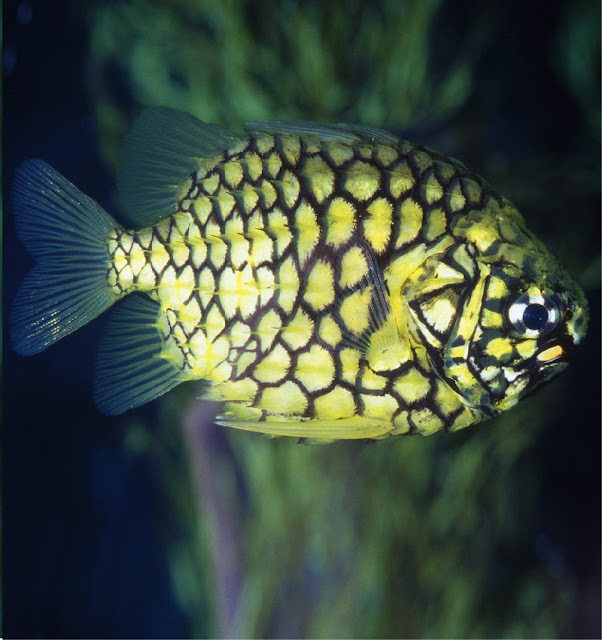 The fish is also known as pinecone fish and knight fish or court-of-the-mail fish. 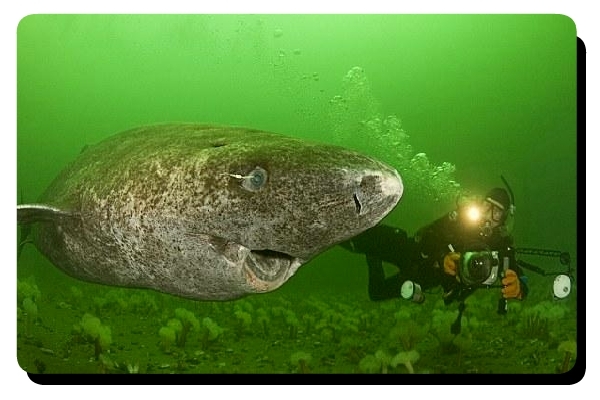 Yes, you guessed it right, the fish has large, armor like scales. It looks like a ripe pineapple with fins. 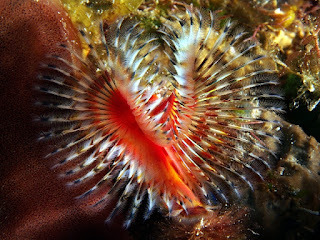 The scientific name of the fish is Cleidopus gloriamaris. 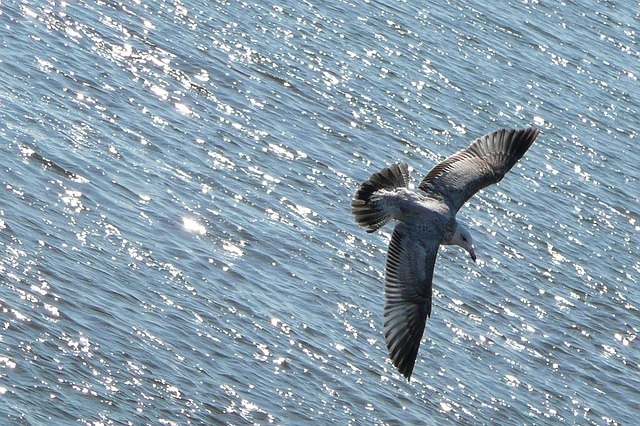 The term “gloriamaris” means “glory of the sea”. Really, it is a glorious creature. The fish belongs to the Monocentridae. There are three other members in that family. All have strong scale armor for protection. 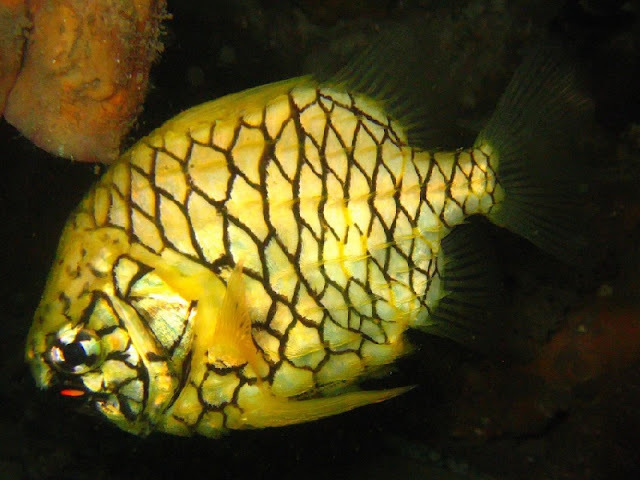 One of the most striking features of the Pineapple fish is bioluminescence. There is a pair of light emitting organs inside the mouth. These are near the lower jaw. The light is only visible when the fish opens the mouth. That light is produced by a type of bacteria that lives inside those organs. The color of the light is green in the young fishes but become more reddish with age. The bioluminescent bacteria living inside the light pits of a pineapple fish is known as Aliivibrio fischeri. These micro organisms live in symbiosis with other marine animals like bobtail squid too. The bacteria can also be free living. The mature fishes often eject some of the bacteria in the open ocean. It probably helps to keep the supply chain of light emitting bacteria intact. The light produced from the mouth of the fish helps it to find prey. 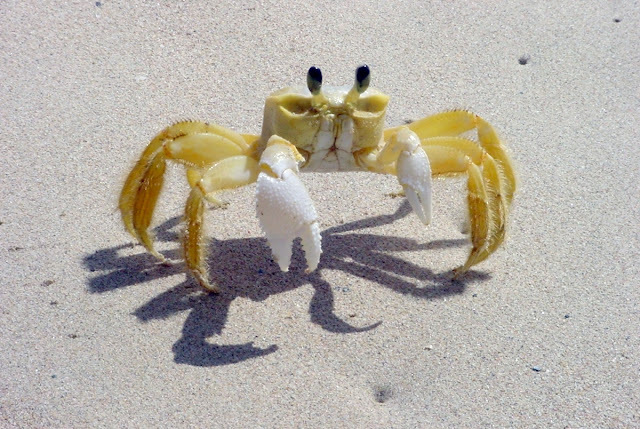 Small crustaceans and fishes become attracted by the light at night. 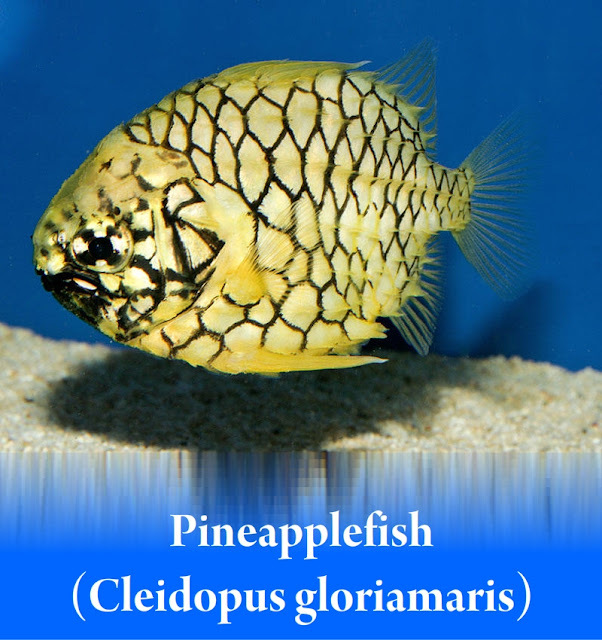 They come close to the mouth and become food of a pineapple fish. The knightfish is not a good swimmer. The rigid and heavy scales are obtrusive to movement. That is why the fish is a nocturnal hunter. It lives inside rocky ledges and caves. It remains hidden in the daytime. It remains in the ocean bottom in reefs and harbors at a depth ranging 30 to 700 ft.Pineapple fish is not found anywhere except Australia. It lives in the coastal waters of east and west Australia. 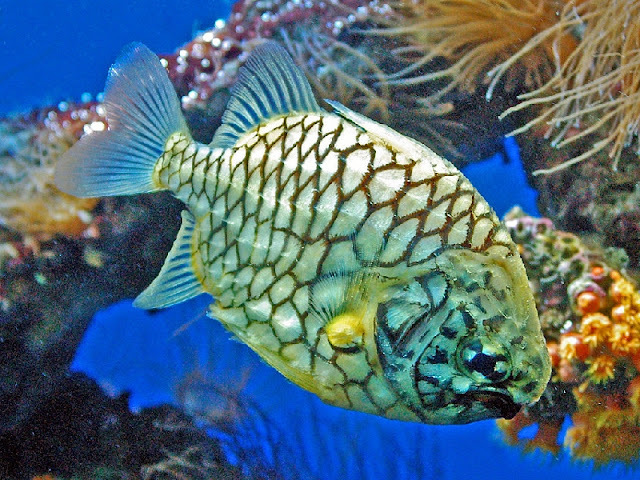 A pineapple fish can grow up to 10 inches or 25 cm. It is so heavy that a 10 inch fish weighs 5 lb or 2.3 kg. The body is covered with large and hard scales. The color of the scales is yellow. 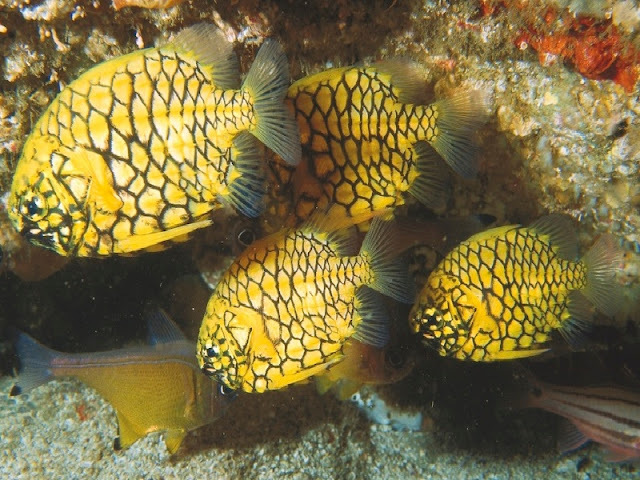 The scales have black rear margins which give the fish a unique look.There is a pair of long pelvic spines. 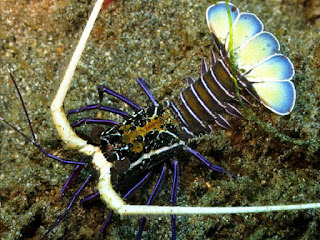 These spines can become erect to help the fish “stand” on the sea bed. The fish is totally harmless to humans. Due to its unique shape color and bioluminescence, it is popular among aquarists. The fish has high demand in the trade and is quite expensive too. It needs a large tank and live marine food to survive. It can live up to 10 years in captivity. It is not caught commercially as food.